Arthur Curry is ready to fight in the latest photo from the Aquaman movie. Jason Momoa made a big impact in Justice League this year, even if the movie managed to disappoint in many ways, overall, in the eyes of certain fans and critics. 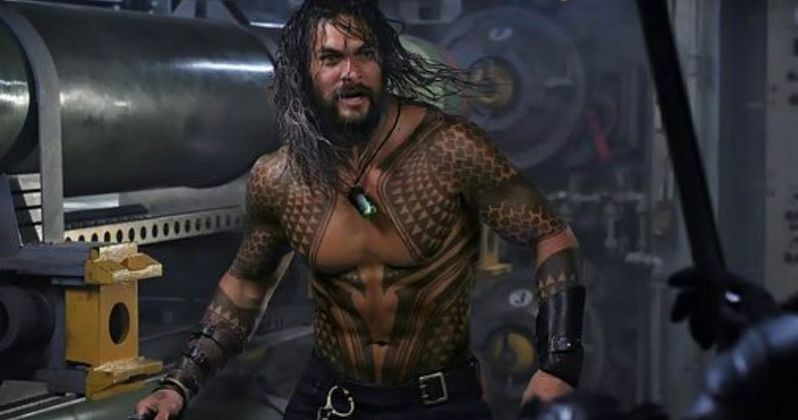 But Momoa gets a chance to lead his own movie with Aquaman next year and now, a brand new image has surfaced online that shows Arthur Curry in action. The image sees Arthur Curry, in all of his shirtless glory, wet hair in motion and ready to put those muscles to good use. It looks like someone just outside of the shot is coming at him and, based on what we saw from Aquaman in Justice League, that won't end so well for whoever is coming his way. Director James Wan had this to say about the Aquaman solo movie, which arrives in theaters on December 21. "He doesn't quite fit in, but as the story progresses, he realizes he's the best of both worlds. Circumstances allow him to grow as a human being and then realize the bigger picture of it all and what it means to have these abilities." Director James Wan, best known for directing movies like The Conjuring and Furious 7, also says he wants to "make something that is from our planet but at the same time, it's a visual we're not familiar with." As for how this movie will differ from what we saw of Aquaman in Justice League? Speaking about it in a recent interview, Jason Momoa says this is going to be much more in-depth. "Justice League was only a weekend in Arthur Curry's life. This is a totally different beast. In Aquaman, you see when his parents met and what happened to them. Then the little boy being raised and finding his powers and going through that and never being accepted on either side. And then becoming this man who puts up all these walls. You just slowly see this man harden up and be completely reluctant wanting to be king and not knowing what to do with these powers he has. I think James Wan just killed it." The DCEU is currently in an interesting place. Justice League is going to go down as something of a bomb, even though it's going to make close to $700 million worldwide. As far as Aquaman goes, it's going to be the next live-action DC movie to arrive in theaters, but it will be more than a year after the release of Justice League. Perhaps that will allow for fans to hit the reset button a bit and, maybe more importantly, for Warner Bros. to figure out how to handle the DCEU moving forward. In addition to the new photo, James Wan also confirms that Black Manta (Yahya Abdul-Mateen II) will be the main villain of the movie. Patrick Wilson is also playing Ocean Master and Dolph Lundgren is on board as King Nereus. Wan says that Black Manta "is very primal, that classic revenge story. I love the simplicity of that human drive." Be sure to check out the new photo of Jason Momoa in Aquaman, courtesy of USA Today, for yourself below.